Eritrea and Ethiopia have an intertwined history, unfortunately not a peaceful one. They are neighbors in the horn of Africa. Eritrea was named by the Italians who colonized that area in 1890. The name was originally derived from the Greeks. It is what they called the body of water known as the Red Sea. Eritrea has about 620 miles of coastline along the Red Sea, Sudan lies to the north and northwest, Djibouti to the southwest and Ethiopia to the south. Eritrea was part of Ethiopia until it was sold to the Italians in the late 19th century. It remained an Italian colony until the British took control in 1941. In 1952, the United Nations federated Eritrea with Ethiopia, which was completely against the will of the Eritrean people. It took a 30 year, liberation war before the Ethiopians left Eritrean soil. Although Eritrea gained independence in 1993, it has been a constant battle over territories along the border with Ethiopia. Eritrea has had the same president, Isaias Afewerki, since her independence. Since then, there has never been an election, nor has the constitution been implemented. Eritrea has been run as a single-party, presidential republic. Basically the president is both head of state and head of government. The government uses its citizens to work mines, public work projects, and the ruling party’s commercial and agricultural enterprises. This country is referred to as the “North Korea of Africa” because of the human rights violations including the militarization of society and no freedom of speech, press or religion. People are risking their lives every day to flee the country. Some make it to neighboring refugee camps, some go across the Mediterranean to Europe and many just die trying. The government implemented a mandatory conscription for able bodied adults between the ages of 18-55, for an “undetermined period of time.” They are forced into hard labor in extreme conditions and for next to no pay. It appears no one really knows what is going on there, other than what is learned from the refugee accounts. The country does not allow international humanitarian and human rights organizations any access, nor is there any independent media. The government claims that it is working toward a path of self-reliance so that it does not have to depend on anyone else, especially the west, for trade, food or other services. The population of Eritrea consists of nine ethnic groups, the largest being the Tigrinya. The capital, Asmara, is located in the highland plateau. The Christian Orthodox, highland culture is shared between Eritrea and Ethiopia. Historically, in Eritrea there was a division between the highland Christians and the Muslims in the lowland but war has bridged that gap. The two official languages of Eritrea are Tigrinya and Arabic, although many Eritreans also speak Amharic, which is Ethiopia’s official language. English is taught as a second language from the second grade on up in their schools. More than 75 percent of the population there live rurally, in small villages and rely on subsistence farming. The country actually has many resources; gold, potash, zinc, copper, salt, oil and natural gas and fish. But war has taken its cruel toll on the infrastructure, land and the people. Ethiopia is the only country in Africa that was not colonized. They managed to win the fight against the Italians in 1896, which preserved the country’s independence. The Italians however, briefly occupied Ethiopia from 1936-1941. The capital city of Ethiopia is Addis Ababa, which means “new flower” in Amharic. Located at an altitude of 7726 feet, it is the third highest capital in the world. Seventy percent of Africa’s mountains are located in Ethiopia and yes, they even get snow. Lake Tana is the source of inflow to the Blue Nile that meets with the White Nile in Sudan, to become the Great Nile, flowing all the way to the Mediterranean Sea. Lake Tana supplies 85 percent of the water to the Great Nile. Ethiopia has vast agricultural potential due to its fertile land, diverse climate and normally, adequate rainfall. The land does suffer from periodic droughts and its poor infrastructure, especially in the highlands with unpaved roads, makes it difficult to move products. The number one export crop is coffee and it is believed that it originated there. Both Ethiopia and Eritrea have a coffee ceremony, a common ritual. It lasts for at least an hour, with at least three servings. It would be considered rude to leave early or not accept a serving. The server starts a fire and roasts green coffee beans while burning frankincense. The server may walk the roasting beans around and fan them so everyone can enjoy the aroma. Once roasted, the beans are ground with a mortar and pestle, and then placed in the pot, called a jebena. Water is added and the jebena is removed from the fire. The coffee is then ready for serving after a brief brewing period. Ethiopia was ruled by a monarchy, known as the Solomonic Dynasty, with close ties to the Orthodox Church, for nearly 1600 years. In 1974, the monarch was overthrown by a communist military regime called “the Derge.” In 1991, the Derge was forced out and today the government is run as a federal parliamentary republic. They have nine ethnically based administrative regions. There are, however, over eighty different ethnic groups that call Ethiopia home, with just as many indigenous languages. The Oromo, Amhara and Tigreans make up over 75 percent of the population. Ethiopia, Eritrea and Djibouti are home to the area where “Lucy” was found. This area was home to some of the earliest hominid populations and Lucy’s skeletal remains provided a missing link in human evolution. Truly the cradle of civilization, there is an extensive history to be learned from these areas. The national epic, “The Glory of Kings,” was compiled by six, Tigrean scribes, who claimed to have translated the text from Arabic to Ge’ez. The story is found in I Kings of the Holy Bible. The Ethiopian version is the premise for the monarchy and significant to nearly all religions. Over thirty years ago Ethiopia’s famine was world news. I vividly remember the pictures of starving, emaciated children with bloated stomachs and mothers trying to keep flies off their babies but with no energy left to shoo them away. It was tragic time, beyond comprehension and millions died horrible deaths. Today Ethiopia is on the mend with a 10 percent growth rate. The numbers of people in poverty are declining and the government is hoping to bring their country into a “middle-income” state by 2025. You may be wondering why I combined these two countries. I did so because they enjoy the same food, they may call it something different but they use the same spices, same spiced butter, and Injera, that spongy bread made from teff. I also recently saw a program called “Breaking Borders.” A news correspondent and a chef go to areas of conflict to get people from opposing sides to sit down for a meal and discuss how peace can be obtained. I do believe a dinner table is a beautiful way to start a dialog and I love the concept. This is also the basis for our Journeys on International Cuisine; bringing the world together one country at a time. 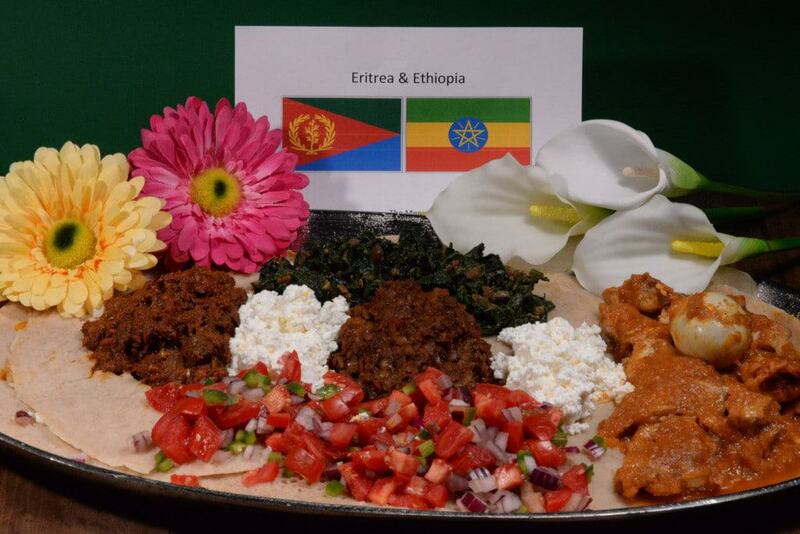 We decorated simply with the national flowers for Eritrea (Gerbera daisies) and Ethiopia (Calla lilies.) 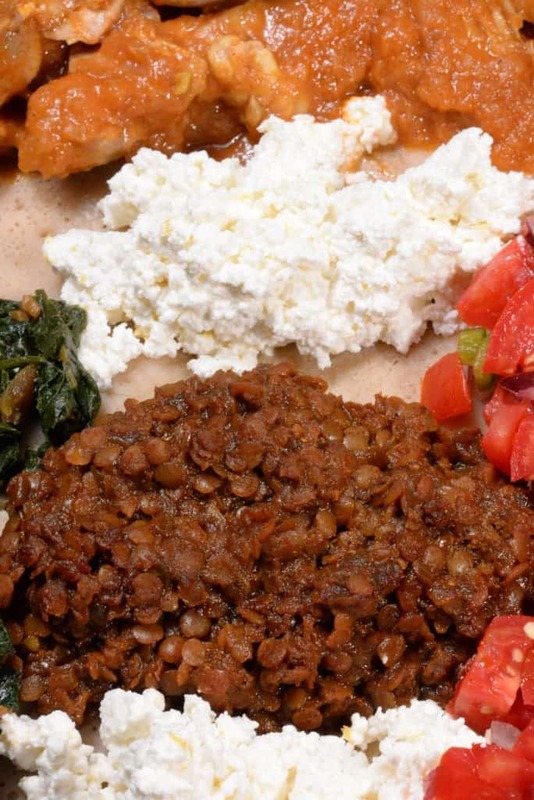 The meal was served on a giant communal tray lined with Injera bread with all the dishes served right on top of the bread. We placed the tray on a low table and sat on the floor as would be customary there. We would begin with hand-washing. The food is eaten with the right hand, you are not supposed to touch your lips with your fingers, just the food, and never lick your fingers. 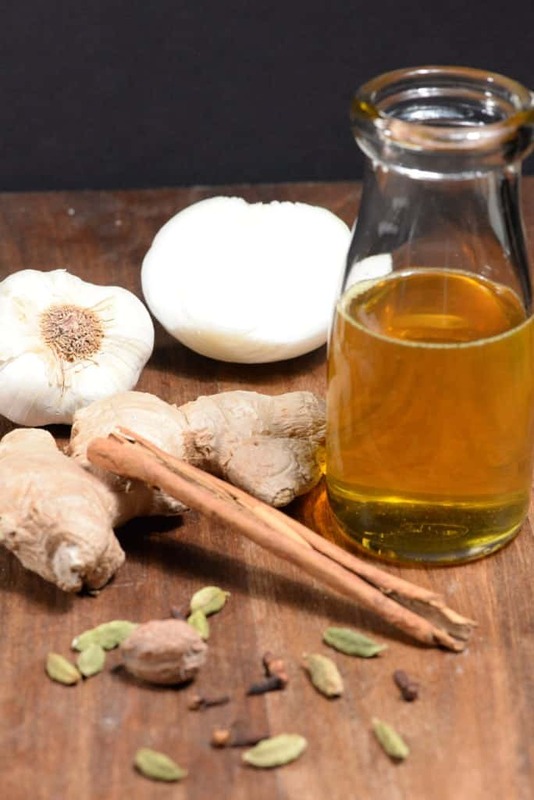 I began with gursha, a gesture I made to my husband to offer him food to put in his mouth. This is very common in both Ethiopia and Eritrea and is a sign of respect. The larger the piece offered, the more the person respects you. 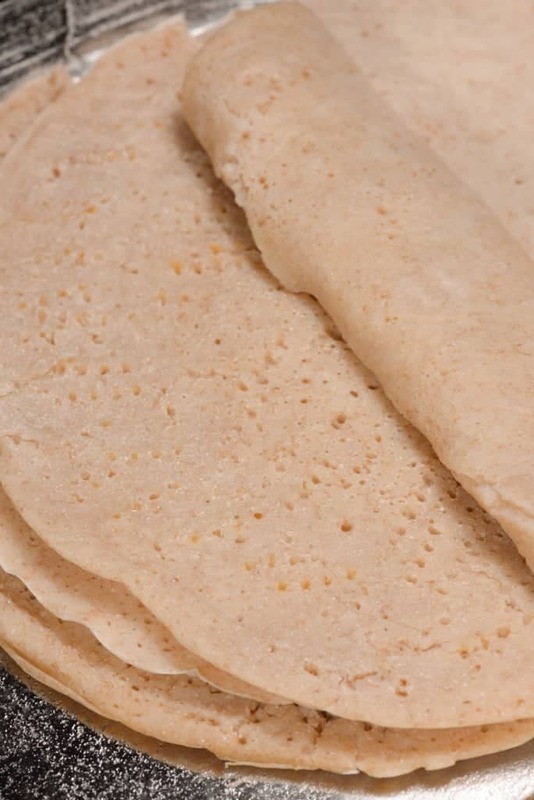 The Injera (bread) is used as the utensil. You use it to scoop up the food on the tray. It’s messy, there is no way around it, but it’s kinda fun. The bread is delicious; it has a sour taste, soft and spongy texture and perfect with the spicy “wat” stew. The bread is made from teff, a tiny grain that means “lost.” It is the smallest known grain and it is called lost because if you drop it, it would be lost. For a tiny grain, it is a powerhouse of nutrition and also gluten free. 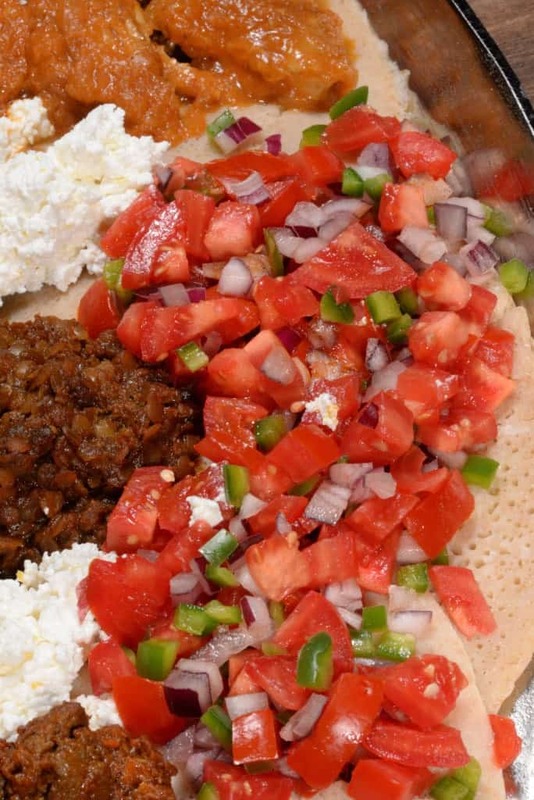 The dishes are made with a very spicy mixture called, berbere. 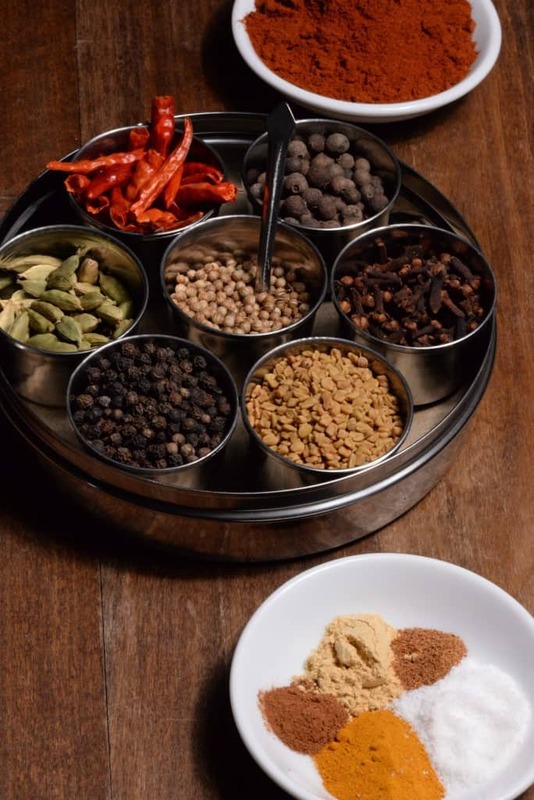 If you make it yourself, you can control the heat, but we are talking exceptionally spicy. 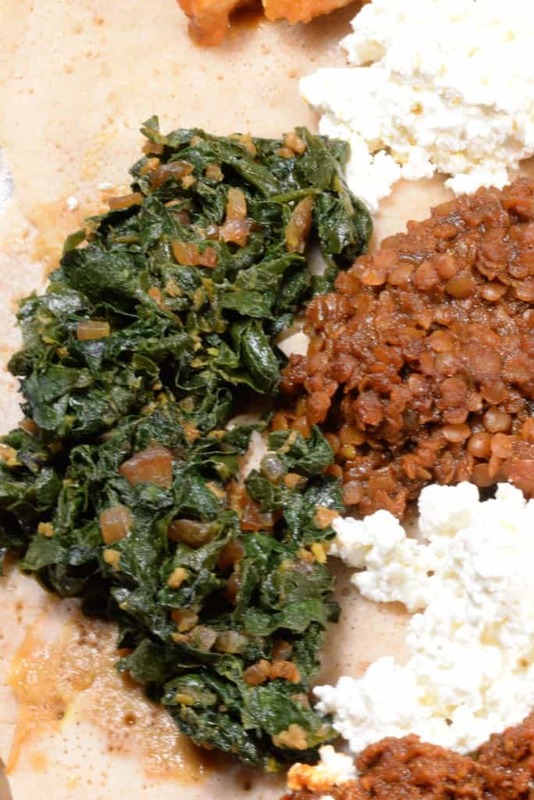 The ayib (a basic curd cheese) and the timatim (a tomato salad) are served along with the stews to help minimize the heat from the berbere seasoning. The greens were sautéed in the amazing nitter kibbeh (a spiced clarified butter) that I found myself wanting to put on everything, (like the popcorn we had along with the coffee for dessert.) The butter is very addictive! All the wat or stew dishes have a base made from lots and lots of onions. The secret to the outstanding taste in these stews or wats is the sweet, caramelization process that occurs as the onions cook. 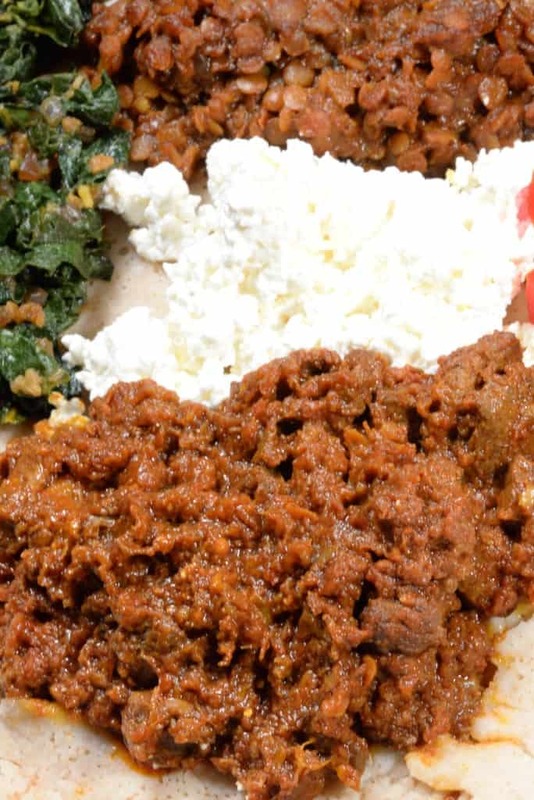 The doro wat is probably the most well-known African dish and for good reason. It is outstanding, you really need to try it. 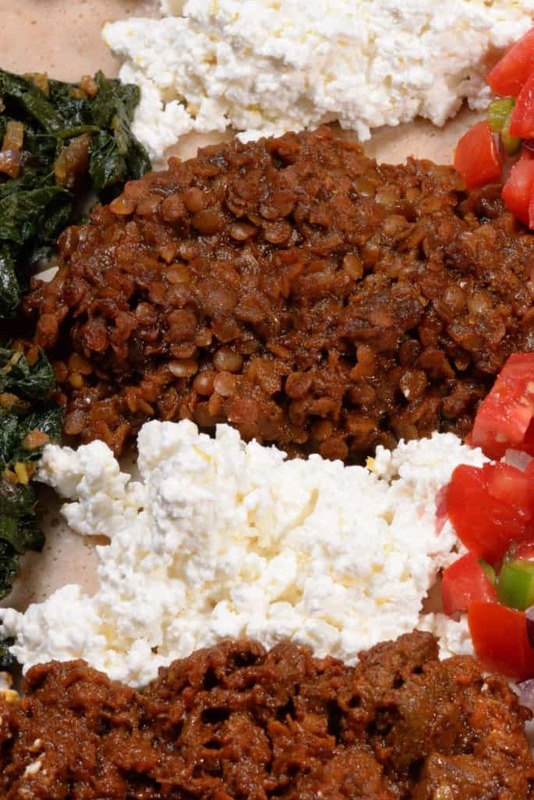 The Zigni dish, which is considered the national dish of Eritrea, is often times served with spaghetti. This is of course, the Italian influence, and is served that way in Ethiopia as well. 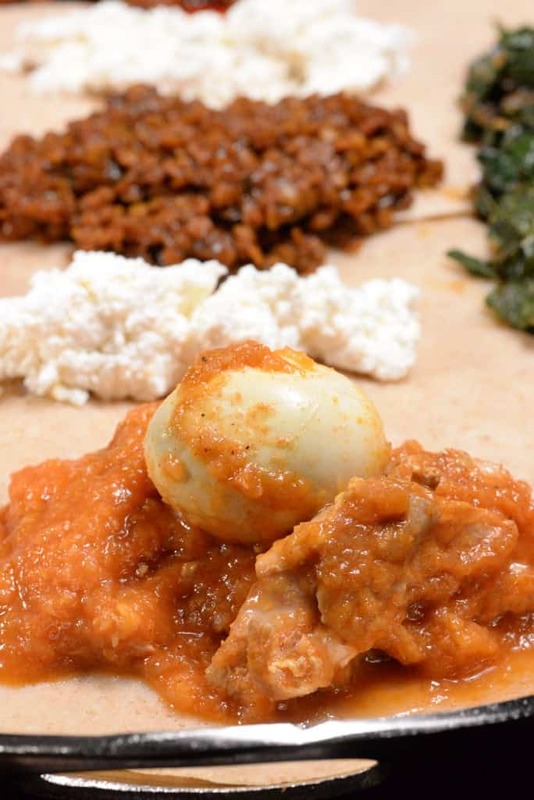 We had it just with the Injera and enjoyed the tomato based, spicy, beef stew. (We had the leftovers with pasta). The vegetarian lentil stew was also amazing. Bottom line, we loved this spicy, rich, earthy food. 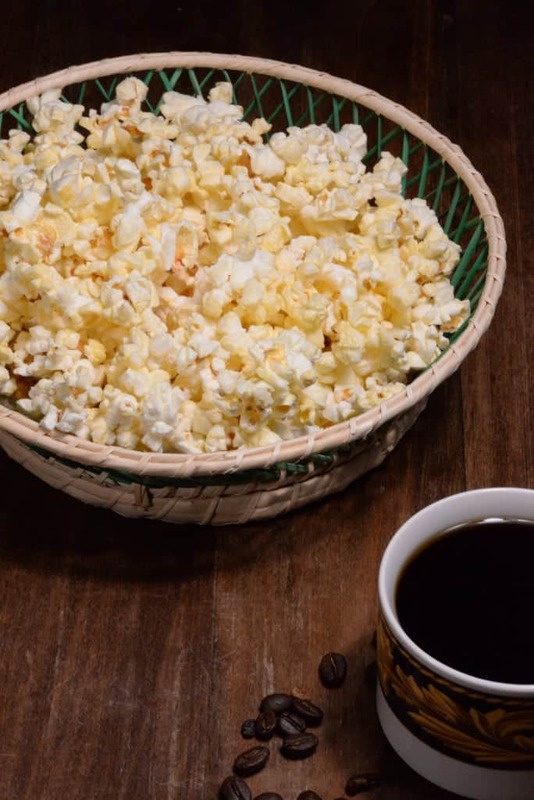 We ended the meal with the some coffee and yes, popcorn smothered in that “oh my gosh,” clarified butter. As we say goodbye to Eritrea and Ethiopia, we do so with hope that these neighbors will learn to live in peace and that the government of Eritrea will realize that something is seriously wrong when your people are fleeing in droves. Perhaps a few natives from each country will use this week’s Journey to share a meal and start the dialogue toward reconciliation. Hi Darlene! It is wonderful site you have! All these tasty traditional dishes, if only I loved more the cooking (am not very patient about that). Whatever, I just wanted to tell you that I love what you do and one day you will have impressive collection of the food heritage of the world! All the best! Thank you so much for your very kind comment. You made my day!